Extra Pale indeed, this beer could pass for a pilsner by sight, but not once you get a whiff of it. The aroma is an unexpected punch in the nose of bright citrusy and floral hops. I’m not one to tell people how to drink (that’s a lie), but you have to pour this beer into a cup to get that glorious smell going. We’ve been crushing cans of this out on our patio at Murphy’s Bleachers all summer, for a very good reason. 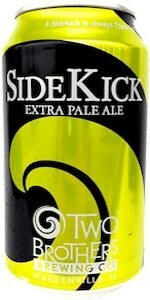 Two Brothers Sidekick is our new favorite session beer in the Chicagoland area. If you haven’t grabbed a six pack of these little aluminum packages of wonderfulness for the golf course, boat, or campfire, you’re missing out. It tastes pretty good out of the faucet at Mrs. Murphy & Sons Irish Bistro too.